‘Space Is The Place’ – a Sun Ra album title from many moons ago – is a fitting description of Fresh Snow’s forthcoming debut album, ‘I’. The improvisations comprise of compelling soundscapes that have space, rhythm and dynamics for the pieces of music to escalate into fully expansive walls of sound. The results are staggering. Across five instrumental voyages, a plethora of ideas – encompassing an array of genres – are fully realized by the Toronto-based group. The large sonic canvas draws from noise, psych, krautrock and indie pop, seamlessly crossing boundaries and in turn, pushing the sonic envelope. Fresh Snow consists of Bradley Davis on guitars, Andy Lloyd (Caribou, Born Ruffians) on bass, Jon Maki (Tropicalia) on drums, and Tim Condon (Mirrored Silver Sea) on laptop/keys. The Toronto-based band started with jams of largely improvised music, before work begun on arrangements of the songs. Stellar guest musicians joined the core four-piece, in the form of Laura C. Bates (Trent Severn, Boxcar Boys) on violin, Aurora Cowie (Triple Gangers) on trumpet and Karl Silveira (trombone) and John David Williams (clarinet). The mixing of the album consisted of a combination of predominately Pro Tools and analog gear. The result is ‘I’, a kaleidoscope of innovative sounds. The album was mastered by James Plotkin, notable for his work with Tim Hecker, OLD and Khanate. Album Opener ‘Saturation Complete’ was also the band’s debut single, which was released last year. What is so impressive is that this twelve minute journey into the heart of krautrock is in fact a debut single. I feel the diverse musical backgrounds where each member comes from, is responsible for the eclectic nature of their sound. ‘Your Thirst For Magic Has Been Quenched By Death’ is a sprawling instrumental opus of strings, synths, guitars, keys and drums. The use of strings adds a gorgeous dynamic and feel to the guitar-led melody. A state of motion is forever inherent in the sonic creations, especially once the bassline comes to the foreground of the mix. ‘To A Sea’ is in a word, lush. The track is a departure from the noise explorations, and remains rooted in gorgeous 60’s pop. A lush pop gem is created, complete with Condon’s vocoder. The use of vocals adds new dimensions to ‘I”s expansive sound, where brighter textures and mood is arrived upon. At the heart of ‘I’is the joyous sound of blissed out jams – ‘Kick Out The Jams’ anyone? – where the creative energies of talented musicians unleash their artistic visions into the world outside. For fans of Neu! and Can, you have just discovered your favourite new band in Fresh Snow. But to use reference points would do injustice to ‘I”s masterful achievements. Upon endless revisits to this remarkable debut, I feel Chicago’s Tortoise are a great parallel, in terms of dynamics and musicianship. 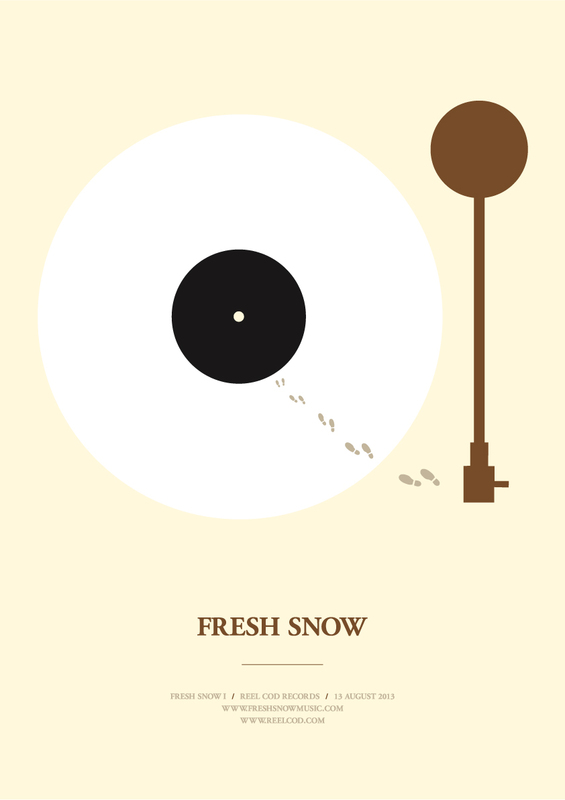 Fresh Snow’s experimentation with sound similarly offers endless possibilities. The band who are renowned for their incendiary live performance – having recently performed Led Zeppelin’s ‘IV’ in its entirety – have distilled their myriad of influences to tape. ‘I’ is just the beginning. 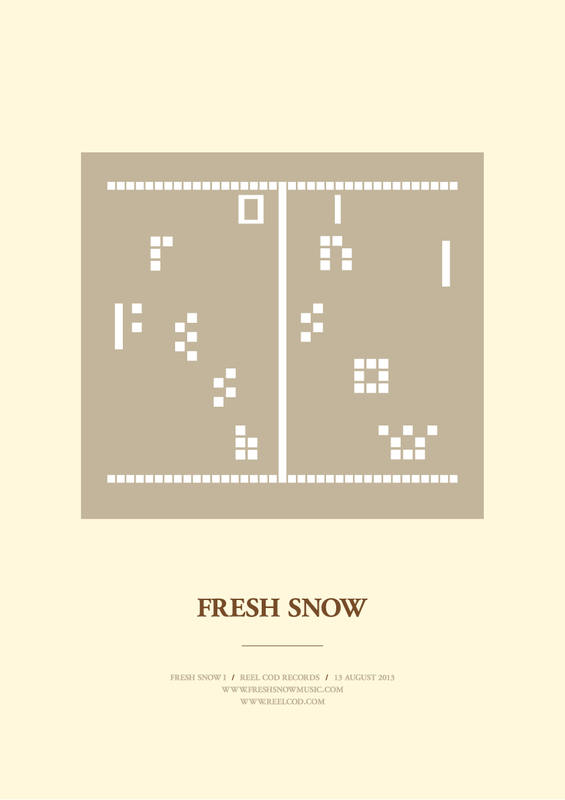 Fresh Snow’s “I” LP will be available on August 13th on Reel Cod Records. Interview with Tim Condon, Fresh Snow. I just love Fresh Snow’s compelling sound. It is large and expansive, yet always, organic and personal. I would love to gain an insight into the formation of the band and the inception of Fresh Snow? Thanks! Fresh Snow came about after Brad was offered a solo show. He drafted in Andy (Caribou, Born Ruffians) on bass, Jon (Tropicalia) on drums and myself (Mirrored Silver Sea) on laptop/ keys. We played an improvised show one night in July 2010. 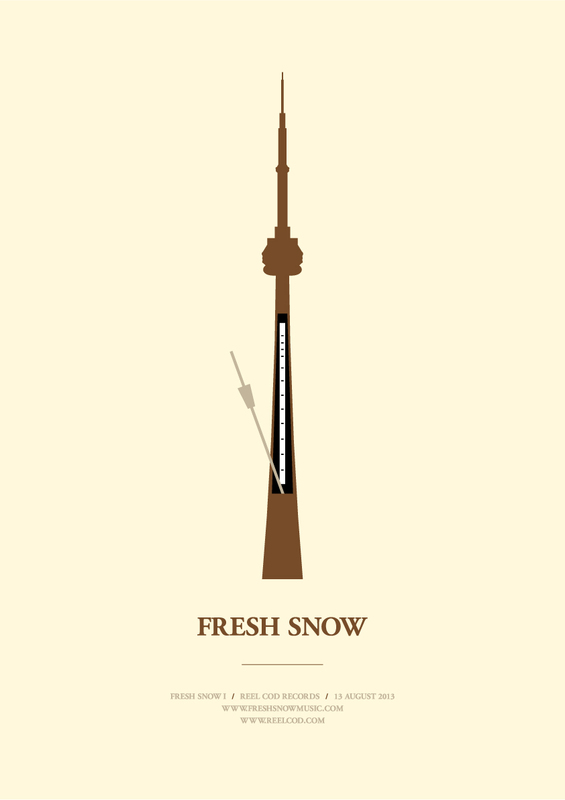 It was a really hot humid Toronto night, so our decision to call ourselves “Fresh Snow” (after a Neu! song) was wishful thinking, if nothing else. It was the first time I met Jon and Andy, just as we went onto stage. It was all improvised and people seemed to like it. The next stage was reconvening in February 2011 at a friend’s basement and we recorded improvised music, slowly working out what the hell we were doing. We walked away with a 7 hour Pro Tools session for Brad and I to work on. By November 2012, after almost two years of work, the album is finished. It is sent off for mastering by James Plotkin (Tim Hecker, Khanate,). By this point we had played many shows and had cohesive intentions to what we do. In hindsight, if we’d written, rehearsed, and then recorded the songs the inception of the band and the record would have been a much easier/ faster route. But I don’t believe the album could have turned out the same way if this had been the case – the benefit of spending almost two years on arrangements took us in a direction that would have been difficult to have come across in a rehearsal space, and allowed us the opportunity of trial and error with “I”. Congratulations on the debut full-length album, ‘I’. A sonic marvel is created, where krautrock, ambient, psychedelic and pop are effortlessly fused together. Please tell me about ‘I’ and the recording/mixing of this set of songs? Upon listening to ‘I’, it is clear how the magical spark of creativity and flowing energy is captured wonderfully from start to finish. The initial recording came about during the aforementioned basement recording session – 7 hours of sound to then be chipped away into just under an hour’s worth of music. Brad and I spent the next 9 months or so editing this into arrangements that we could work with. Some of the initial structure for the pieces was similar to what the four of us had played on the day. Much of it wasn’t though – we took snippets of performance (often as short as 3 seconds) and then edited/ treated/ manipulated and arranged them into new pieces. Once we had basic arrangements of pieces we re-recorded the majority of the album with the band, using these edited arrangements as templates. With the re-recording, we were able to re-introduce aspects of improvisation and non-linear performance, now that we had arrangements and pieces as a structure to work within. Brad and I spent a further six months overdubbing guitars, keyboards and processing sound ourselves. We then brought in some exceptional guest musicians – Laura C. Bates (Trent Severn, Boxcar Boys) on violin, Aurora Cowie (Triple Gangers) on trumpet and Karl Silveira and John David Williams – trombone and clarinet respectively (from the Boxcar Boys as well). Laura played a huge role in the arrangement of the string sections, as did Aurora with the coda of “BMX Based Tactics”. This coda features 55 tracks of trumpet (primarily for the purpose of producing the drones that are heard throughout this section) and we were concerned that upon each request for another take from Aurora that we may have been looking at a manslaughter charge – with her face becoming redder and redder as the piece went on, losing all remaining breath…Through the writing process and mixing process we were keen to have a balance between arrangement/ structure and ambient sound as texture, which hopefully comes across throughout.I then mixed the album with a combination of digital gear (Pro Tools primarily) and outboard analog gear. My personal favourite is ‘Your Thirst For Magic Has Been Quenched By Death’. A great title and an awesome interstellar journey. A sacred dimension is tapped into here, where guitars, violin, synthesizer and drums build slowly into a magical realm of achingly beautiful sound. Please discuss the construction of this song? Was the violin melody the pre-cursor to the song? Thanks again! The pre-cursor to “Thirst…” initially came about by a loop of Jon’s drumming – a beat that was fragmented, heavy and pretty propulsive. I looped this, then Brad sequenced some analog synthesizers to form the arpeggio that runs throughout. He then accompanied this with the guitar line. I edited this into sections to create the intro (and added the introductory guitar), verse (where I added the strings and synths), “chorus” and outro. We then brought Laura in to further strengthen my string/ synth parts with her violin. Jon then overdubbed drums, and finally Andy added his bass. As bass is so central to our sound it was unusual to leave it to be introduced so late in the piece, but for this we were very much favouring space, rhythm and increasing dynamics to lead to the introduction of the bass. Hopefully when Andy’s bass finally enters it is significantly propulsive. ‘To A Sea’ is the gorgeous opening track to Part B of the record. A guitar rock rhythm has timeless shades of Velvet Underground and Neu! I love how the instrumentation of voice, glockenspiel and shaker adds new textures to the record’s sonic canvas. The brass section is utterly compelling amidst the soaring synths. Please tell me about the instrumentation used here, and the different sections inherent in ‘To A Sea’? This song started with Brad’s guitar throughout. Brad has a background of guitar-based pop (amongst others) and at around the 6th hour of the initial recording session this song came about – I think we were all worn down by a lot of noise so we opted for something quieter! The body of the piece is pretty much as is from the initial session, however has been further augmented with pretty much whatever Brad and I could throw at/ make work with it. We wanted it to be as lush as possible, so we went with glockenspiel, analog string machine (Roland RS202), drum machines, trumpets and trombones (played again by Aurora and Karl), synths (Roland Jupiter) and finally my vocodered voice. The lyrics are naive and sentimental and only my wife knows the lyrics – I’d be too embarrassed for them to be intelligible, thus the vocoder! The second section/ outro is totally Brad’s love of classic guitar pop coming through again! We liked the idea of something sparse, with lead guitar lines sounding like they were from a Easybeats/ Yardbirds album. The rest of the accompaniment is all rooted in 1960’s sounds, so doesn’t sound too innovative, but it is a nice change in the context of the album! It’s also nice to have at least one song on the album that we can play to our family members that does not come across as awful noise. What are the defining records for you? Personally those that influence my decisions with music making and mixing are in particular: The Black Heart Procession – 1, Mercury Rev – Deserter’s Songs, Labradford – Mi Media Naranja, Portishead – Third, The Necks – Drive By, Low – Songs For A Dead Pilot, Wilco – Yankee Hotel Foxtrot, LCD Soundsystem – Sound Of Silver, Rosy Parlane – Iris. ‘Helix Pass’ is sublime. The gorgeous use of instrumentation is breathtaking – the brass and strings meld together so perfectly with the transcendent guitars and synths. How was this song put together? Helix Pass came about by a 3 second loop of Jon’s drumming that we liked from the initial recording session. I then arranged this into 7 minutes of drums. Brad then wrote the main keyboard line throughout and I wrote the acoustic guitar chorus hook, Andy wrote his bass part which gave it the definition that it needed and then Jon overdubbed drums onto it. I then augmented this with layers of keyboards and granular synthesis. By this point it was shaping up pretty well so we brought Laura and Aurora (Laurora?) in to further define the sections with their respective violin and trumpet. Karl also played trombone on it. We had around 15 different endings to this piece at various points, but after playing it more and more live we moved towards the heavy “doom” piano, violin, guitar sustain ending, as performed live this normally feeds into “Thirst” and works really well. This ending worked well for the album version, so we re-recorded this and finally committed to it. This track, alongside cassette only track “French Horse Hall Of Fame”, was by far the most intensively worked piece on the album. Do you plan to tour Europe? I hope so. We hope to, and are certainly open to offers! I lived in London for almost three years and was fortunate to visit much of Europe, and would really love the opportunity for Fresh Snow to play in Europe. Berlin, Copenhagen, Warsaw, Paris and Stockholm in particular are cities I really love. I feel a great affinity for many European labels (Kompakt, Editions Mego, Bedroom Community, Touch & Mille Plateaux in particular) so would love to play on the same soil that has produced so many important records and artists. I’d/ we’d love to play the UK as well. The music scene in London and Dublin was very inspirational, and I very much enjoyed being home from shows by 11.30pm! That’s much more manageable than finishing shows here in Toronto at 2am, as the -15C weather settles in. What are you listening to most lately? Since finishing the album and not being employed I’ve had a lot more time to listen to music! El-P & Killer Mike’s most recent albums, Radian – Juxtaposition, Ben Frost – By The Teeth (his music is probably what makes me most patriotic to be an Australian! ), Hildur Guðnadóttir – Without Sinking, Motobeacon – Alt’s Garage (fantastic Toronto duo), Dusted – Total Dust (the new duo by Brian Borcherdt, my favourite artist from Toronto), Iderdown – A Semb (wow…. ), Fire! (with Jim O’Rourke) – Unreleased?, Unseen Machine – The Devil’s Hard Drive (wow x2…..) & Koen Holtkamp – Gravity/Bees. There has been so much exceptional work put out in the last few years – this is a really great time for music lovers. Fresh Snow’s “I” LP will be available on August 13th. The tape version is available now which contains an extra track. A special Reel Cod Records release show for Fresh Snow-I will take place on August 8th at the Boat in Kensington Market, Toronto.